Which products do I apply first? What is the benefit of using Rooibos tea instead of water in you facial routine? Tap water contains harsh chemicals like chlorine and fluoride that damage and age our skins. Rooibos neutralises their effect and add pure antioxidants to your skin. Rooibos, Aspalathus linearis, is a herb indigenous to South Africa. The name is a direct translation from the Afrikaans language and literally means "red bush". After harvesting the tea is normally left to ferment for a number of hours and the tea leaves that look like pine needles; change to a rusty red colour. The unique antioxidant and mineral content of Rooibos tea surpasses that of regular black teas and puts it in a class of its own. Green Rooibos tea is not left to ferment and is dried immediately after harvesting. Green Rooibos tea is superior to normal Green Tea because of the rich antioxidant and mineral content; PLUS it is NOT BITTER due to the low tannin content! Rooibos tea is naturally rich in minerals and anti-oxidants and is naturally caffeine-free and low in tannin. Because Rooibos tea does not contain oxalic acid it can also be enjoyed by people suffering from kidney stones. Rooibos modulates the level of enzymes in the liver that can cause cancer. Rosacea is a condition which is becoming increasingly prevalent among our clients. It is primarily a chronic condition which is accompanied by severe redness and irritation of the skin and pimples in some areas. Anyone can be affected by Rosacea. It follows four phases – the ﬁrst three affect the skin, and lastly the eyes may be affected as well. This condition will deteriorate over time and will not simply go away by itself – it has to be treated. Usually, it ﬁrst affects the nose, brow and cheek-area after which it may spread to the rest of the body. Initially it was believed that people with light, sensitive skin and red or fair hair were mostly affected, but there is no evidence to prove this. Rosacea can often be misdiagnosed as a sensitive skin because of the many similarities between the two conditions. The skin can ‘burn’ and feel incredibly sensitive throughout the day. It can therefore be treated in much the same way as sensitive skin, but we add a few additional products. A product recommended by Annique is Essense Intense Repair Serum for daily application (preferably every evening). Many clients are concerned that an oil-product would keep the heat inside, but do remember that there are many different kinds of oils, and it really depends on the formulation of the particular oil. He/she should preferably avoid the following: • Hot ovens. • Cold fridges and freezers. • Heat from a hairdryer near the skin. • Any form of steam baths, hot showers, baths, etc. • Any hot foods such as curries, spicy foods, and certain kinds of alcohol, which can also aggravate the condition. It is also vital that the skin is protected against sun, wind and any extreme weather conditions. 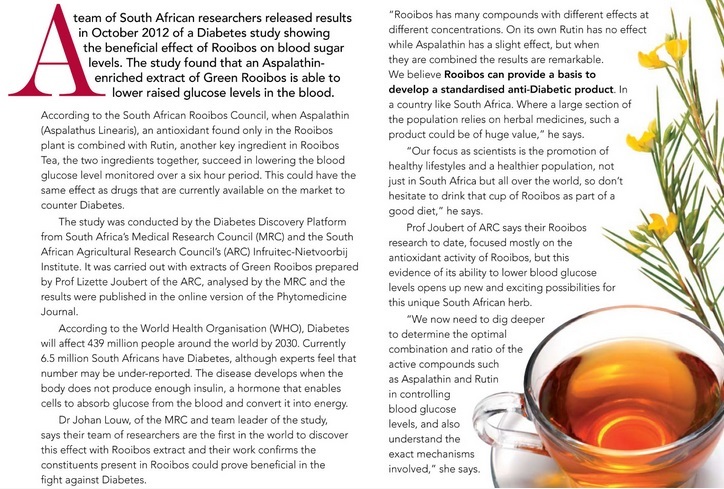 A lot of research is currently being done on Rooibos tea drawing more and more attention to the plant's numerous healthy properties.